The Punjabi people (Punjabi:ਪੰਜਾਬੀ , also Panjabi people) are an Indo-Aryan ethnic group from South Asia. They originate from the Punjab region, which has been host to some of the oldest civilizations in the world including one of the world's first and oldest civilizations, the Indus Valley Civilization. The Punjabi identity is primarily cultural and linguistic, with Punjabis being those whose first language is Punjabi, an Indo-European tongue. In recent times, however, the definition has been broadened to include also emigrants of Punjabi descent who maintain Punjabi cultural traditions, even when they no longer speak the language. Punjabis are mostly and primarily found in the Punjab region, of India & Pakistan , which forms the present Indian state of Punjab and Pakistan province of Punjab , this is because the Punjab region was divided between the two nations at independence from Britain. In Pakistan, Punjabis comprise the largest ethnic group at roughly 60% of the total population of the country and reside predominantly in the province (state) of Punjab and Azad Kashmir . In India, Punjabis represent about 3% of the population. The majority of Punjabi-speaking people in India can be found across the greater Punjab region which comprises the states of Punjab , Haryana , Himachal Pradesh , Delhi and the Union Territory of Chandigarh . Besides these, large communities are also found in the Jammu region of Jammu and Kashmir and the Indian states of Rajasthan , Uttaranchal and Uttar Pradesh . Punjabi is the most spoken language in Pakistan and 11th most spoken language in India and 3rd most spoken language in South Asia. According to the Ethnologue 2005 estimate, there are 88 million native speakers of the Punjabi language, which makes it approximately the 11th most widely spoken language in the world. According to the 2008 Census of Pakistan, there are approximately 76,335,300 native speakers of Punjabi in Pakistan, and according to the Census of India, there are over 29,102,477 Punjabi speakers in India. Punjabi is also spoken as a minority language in several other countries where Punjabis have emigrated in large numbers, such as the United Kingdom (where it is the second most commonly used language) and Canada , where in recent times Punjabi has grown fast and has now become the fourth most spoken language.. Punjabi is the 2nd most common language in the UK after English. The 4th most common spoken language in Canada after English, French and Chinese. There are also sizable communities in United States , Kenya , Tanzania, Uganda, Persian Gulf countries, Hong Kong , Malaysia , Singapore , Australia and New Zealand . Punjabis are ethno-linguistically and culturally related to the other Indo-Aryan peoples of South Asia. There are an estimated 120 million Punjabis around the world. The exact point at which the Punjabis formed a distinct ethnic group remains speculative. The region having been the site of the ancient Indus Valley Civilization centred at Harappa became a centre of early civilization from around 3300 BC. Numerous settlers including the Indo Aryans, Persians, Scythians, Greeks, various Central Asians, Arabs, Afghans, and the British have all invaded and ruled the region, giving the Punjab a unique culture as the gateway to South Asia. The Indo-Aryans are believed to have arrived in the region between 2000 and 1250 BC and eventually disseminated their languages throughout South Asia. An early Vedic civilization is believed to have emerged in the region and helped shape many aspects of the early culture. Over time, the Greater Punjab region fragmented as various Eurasian settlers conquered sections of the region with the west (Pakistan) bearing the brunt of most invasions and where ultimately many of them settled. Various religious influences shaped the region and people. From early Hinduism to earlier forms of Shamanism and Zorastrianism gave way as Buddhism emerged as an important faith in the region, Ultimately, two later religions largely supplanted both of these earlier faiths, Islam from the 8th century onwards, and Sikhism, which emerged in the fifteenth century. Islam reached the region following the arrival of Arabs in 711 AD (see Muhammad bin Qasim) and Turkic tribes in the 11th century, soon after this the majority of the population gradually adopted Islam. Following the independence of Pakistan and the subsequent partition of British India, a process of population exchange and ethnic cleansing took place in 1947 as Muslims left East Punjab and headed to the newly created Pakistan, and Hindus and Sikhs left West Punjab for the newly created state of India. As a result of these population exchanges, both parts are now relatively homogeneous, where religion is concerned. The main site of the Indus Valley Civilization in Punjab was the city of Harrapa . 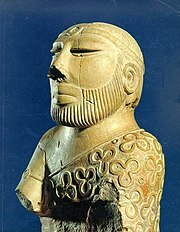 The Indus Valley Civilization spanned much of what is today Pakistan and eventually evolved into Indo-Aryan civilization. The arrival of the Indo-Aryans led to the flourishing of the Vedic Civilization along the length of the Indus River . This civilization shaped subsequent cultures in South Asia and Afghanistan . Although the archaeological site at Harappa was partially damaged in 1857 when engineers constructing the Lahore-Multan railroad used stone from the Harappa ruins for track ballast, an abundance of artifacts have nevertheless been found. Punjab was part of the great ancient empires including the Gandhara Mahajanapadas, Mauryas, Kushans and Hindu Shahi. Agriculture flourished and trading cities (such as Multan and Lahore ) grew in wealth. Due to its location, the Punjab region came under constant attack and influence from the west. Invaded by the Persians, Greeks, Kushans, Scythians, Turks, and Afghans, Punjab witnessed centuries of bitter bloodshed. Its legacy is a unique culture that combines Zorastrian, Hindu, Buddhist, Persian , Central Asian, Islamic, Afghan, Sikh, and British elements. The city of Taxila was founded by the son of Taksh, who was the son of Bharat and who, in turn, was the brother of Ram. It was reputed to house the oldest university in the world, Takshashila University , one of the teachers was the great Vedic thinker and politician Chanakya. Taxila was a great centre of learning and intellectual discussion during the Maurya Empire. It is a UN World Heritage site, and revered for its archaeological and religious history. Unique to central and western regions of Punjab (which form Pakistan's Punjab province) was that this area was incorporated into various central Asian, Greek and Persian empires, the area witnessed invasions by Alexander the Great, Mahmud of Ghazni and Tamerlane, to name a few. These were periods of contact between this region of Pakistan, the Persian Empire, and for a time this extended all the way to Greece . In later centuries, when Persian was the language of the Mughal government, Persian architecture, poetry, art and music was an integral part of the region's culture. The official language of Punjab remained Persian until the arrival of the British in the mid 19th century, where it was finally abolished and the administrative language was changed over to Urdu written in the Perso-Arabic script. After 1947, Urdu, which has Arabic, Persian and Sanskrit roots, became Pakistan's national language (Zaban-e-Qaum). The Punjabis followed a diverse plethora of faiths mainly Hindus but with large minorities of Buddhists, Zoroastrians, Pagans and Shamanists when the Umayyad Muslim Arab army led by Muhammad bin Qasim conquered the Punjab and Sindh in 711. Bin Qasim recorded that he so was overwhelmed by the gold in the Aditya Temple in the thriving trading city of Multan (known as Mulasthana then), that he recovered the expenses for his entire invasion. During the reign of Mahmud of Ghazni, non-Muslims were ordered to pay the jaziya tax, this entitled them to the Muslim state's protection from outside aggression, to be exempted from military service and the Zakat (a welfare tax) as obligatory upon Muslim citizens. The province became an important centre and Lahore was made into a second capital of the Ghaznavid Empire based out of Afghanistan . The Mughals controlled the region from 1524 until 1739 and would also lavish the province with building projects such as the Shalimar Gardens and the Badshahi Mosque , both situated in Lahore. Muslim soldiers, traders, architects, theologians and Sufis flocked from the rest of the Muslim world to the Islamic Sultanate in South Asia and some may have settled in the Punjab. Following the decline of the Mughals, the Shah of Iran and founder of the Afsharid dynasty in Persia , Nader Shah crossed the Indus and sacked the province in 1739. Later, the Afghan conqueror Ahmad Shah Durrani, incidently born in Punjab, in the city of Multan made the Punjab a part of his Durrani Empire lasting until 1762. The founder of Afghanistan, Ahmad Shah Durrani, an ethnic Pashtun (Pathan), was born on the outskirts of Multan , southern Punjab where many of his descendants live to this day. After cementing his authority over various Afghan tribes, he went about to establish the first united Afghan Kingdom (Greater Afghanistan) that during its greatest extent included modern-day Afghanistan, Pakistan and northeastern Iran. The Punjab was a cultural reservoir for the Afghans, and many where attracted to its lush fertile lands, a process that continues to this very day. It has been said that with the loss of the breadbasket regions of the Punjab and Sindh, Afghanistan has never been able to achieve a stable state ever since. Many ethnic Afghan or Pashtun tribes continue to live in Pakistan's Punjab province such as the Khugyanis known as Khakwanis, Alizais, Tareens, Durranis, Mullazais , Niazis, Khattaks, Lodhis, Kakars, Kakazais, and Barakzais to name a few. At the beginning of the fifteenth century, the religion of Sikhism was born, and during the Mughal period gradually emerged as a formidable military force until subjugated and assimilated by the later rising and expanding Sikh Empire. After fighting Ahmad Shah Durrani, the Sikhs wrested control of the Punjab from his descendants and ruled in a confederacy, which later became the Sikh Empire of the Punjab under Maharaja Ranjit Singh. A denizen of the city of Gujranwala , the capital of Ranjit Singh's empire was Lahore. The Sikhs made architectural contributions to the city and the Lahore Fort . The Sikh empire was the first local power to rule the region since Muhammed Ghori's defeat of Prithvi Raj Chauhan in 1192. According to some accounts, Ranjit Singh was not sympathetic to the Muslim inhabitants of the city, he is said to have turned the Badshahi Mosque , one of the most famous examples of Mughal architecture and one of the largest Mosques in the world, into a stable for his horses, other sources claim it was used as a gun powder magazine for military stores. The Maharaja's death in the summer of 1839 brought political chaos and the subsequent battles of succession and the bloody infighting between the factions at court weakened the state. Relationships with neighbouring British territories then broke down, starting the First Anglo-Sikh War; this led to a British official being resident in Lahore and the annexation of territory south of the Satluj to British India. Some parts of Pakistani Punjab also served as the centre of resistance in the Indian Rebellion of 1857. In 1947 the Punjab province of British India was divided along religious lines into West Punjab and East Punjab. The western Punjabis voted to join the new country of Pakistan while the easterners joined India. This led to massive rioting as both sides committed atrocities against fleeing refugees. The undivided Punjab, of which Punjab (Pakistan) forms a major region today, was home to a large minority population of Punjabi Sikhs and Hindus unto 1947 apart from the Muslim majority. Punjabis make up almost 45% of the population of Pakistan. The Punjabis found in Pakistan are composed of various social groups and economic groups. Groups with pre-Islamic ancestry include Punjabi Rajput, Jat, Punjabi Shaikhs or (Muslim Khatri), Kambohs, Gujjars, Dogars and Rahmani (Muslim Labana). Smaller groups include the Gakhars, Awan, and Arains, comprising the main tribes in the north, while Khagga, Bodla, Gardezis, Syeds and Quraishis are found in the south, many of whom claim Arab ancestry. There are also Pashtun (see Punjabi Pathan) tribes like the Niazis and the Khakwanis, which are very much integrated into Punjabi village life. Especially the members of the Niazi tribe, who see themselves as Punjabis first. They have big communities in Mianwali , Bakkar, Lahore , Faisalabad , Sahiwal and Toba Tek Singh . The term biradari is often used to describe these various sub-groups. Punjabis in Pakistan , especially in major urban cities have diverse origins, with many post Islamic settlers tracing their origin to Afghanistan , Persia , Arabia, Kashmir , Turkey and Central Asia. Punjabis have traditionally and historically been farmers and soldiers, which has transferred into modern times with their dominance of agriculture and military fields in Pakistan . In addition, Punjabis in Pakistan have been quite prominent politically, having had many elected Members of Parliament. As the most ardent supporters of a Pakistani state, the Punjabis in Pakistan have shown a strong predilection towards the adoption of the Urdu language but nearly all speak punjabi, and still identify themselves as ethnic Punjabis for the most part. Religious homogeneity remains elusive as a predominant Islamic Sunni-Shia population and a Christian minority have not completely wiped out diversity since the partition of British India. A variety of related sub-groups exist in Pakistan and are often considered by many Pakistani Punjabis to be simply regional Punjabis including the Seraikis (who overlap and are often considered transitional with the Sindhis) and Punjabi Pathans (which publications like Encyclopædia Britannica consider a transitional group between Punjabis and Pathans. The Punjabis found in India are composed of various tribal group, social groups and economic groups. Some minor sub-groups of Punjabis in India include (alphabetical order): Aroras, Kalals/Ahluwalias,Labanas, Nais, and Soods etc. Most of these groups can be further sub-divided into clans and family groups. Some other may include Banias, Bhatias, Brahmins and Chhimbas. The Punjabi tribes of Indo-Scythian origin (Jats, Chamars, Mazhabis, Khatris, Rajput, saini ; Lohar, Gujjar, Kamboj and Tarkhan tribes) are found as a Majority in Punjab.These seven tribes are closely and indirectly related and connected to each other.These tribes also have intermarriages with each other. There is also a minority of Punjabi Rajputs, Punjabi Pathans, Kambohs, Dogars, Labana, Awans, Arians, Gakhars in India. Some of these groups claim to have Arabian, Persian, Turkish heritage. There are few Punjabi Shaikh communities in Indian Punjab mainly in Pathankot. Most of them are Sikhs but a few are Muslims. Although most of the Muslims Shaikhs migrated to Pakistan after 1947 few still remain. Most of East Punjab's Muslims (in today's states of Punjab, Haryana, Himachal Pradesh, Delhi and Chandigarh) left for West Punjab in 1947. However, a small community still exists today, mainly in Malerkotla which was spared during partition, the only Muslim princely state among the seven that formed the erstwhile Patiala and East Punjab States Union (PEPSU). The other six (mostly Sikh) states were: Patiala , Nabha , Jind , Faridkot , Kapurthala and Kalsia. Punjabis in India have mainly Indo-Aryan and Indo-Scythian origin. The Punjab region within India maintains a strong influence on the perceived culture of India towards the rest of the world. Numerous Bollywood film productions use the Punjabi language within its songs and dialogues as well as traditional dances and instruments such as the bhangra and the tabla. Prime Ministers of India including Gulzarilal Nanda and Inder Kumar Gujral in the past, and Dr. Manmohan Singh at present, are Punjabis, as are numerous players in the Indian cricket team (both past and present including Bishen Singh Bedi, Kapil Dev, Mohinder Amarnath, Navjot Sidhu, Harbhajan Singh, Yuvraj Singh, Yograj Singh). The Punjabi people have emigrated in large numbers to many parts of the world. The United Kingdom has a significant number of Punjabis from both Pakistan and India as does Canada (specifically Vancouver and Toronto ) and the United States, (specifically California's Great Central Valley ). The Middle East has a large immigrant community of Punjabis, in places such as the UAE and Kuwait . There are large communities in East Africa including the countries of Kenya , Uganda and Tanzania. Punjabis have also emigrated to Australia, New Zealand and Southeast Asia including Malaysia , Thailand , Singapore and Hong Kong . Young men and women inside an internet cafe. The Punjab region is diverse, due to its location near Central Asia. It has been prone to numerous migrations and the resulting settlers have left imprints upon the local Punjabi population that remain present in the numerous sub-groups. The Punjabi people are a heterogeneous group and can be subdivided into a number of ethnic clan groups in Pakistan called qaums while they adhere to caste identities in India , each having their own subtle differences. Results show that Indian tribal and caste populations derive largely from the same genetic heritage of Pleistocene southern and western Asians and have received limited gene flow from external regions since the Holocene. Broadly, the average proportion of mtDNAs from West Eurasia among Indian caste populations is 17% (Table 2). In the northern States of India their share is greater, reaching over 30% in Kashmir and Gujarat , nearly 43% in Indian Punjab . Some preliminary conclusions from these varying tests support a largely north Indian genetic base for most Punjabis accompanied by some of the highest degrees of west Asian admixture found in north India. Punjabi Culture is the culture of the Punjab region. It is one of the oldest and richest cultures in world history, dating from ancient antiquity to the modern era. The Punjabi Culture is the culture of the Punjabi people who are now distributed throughout the world. The scope, history, sophistication and complexity of the culture are vast. Some of the main areas include, Punjabi Philosophy, poetry, spirituality, education, artistry, dance, music, cuisine, science, technology, military warfare, architecture, traditions, values and history. Science, history and Religion has played an important role in shaping Punjabi ethnic identity and it is not uncommon for Punjabis to generally treat their religious identity as synonymous with their ethnic identity or at least a combined identity that differentiates them from others. Punjabis belong largely to three major religions: Islam (70%), Sikhism (15%) and Hinduism (10%) and also small numbers of Christianity, Jainism and Buddhist. Muslim Punjabis are the largest group in the Punjab region and are largely concentrated in Pakistan, though a small Muslim Punjabi population exists in India. Sikhism and Hinduism are the major religions followed by Punjabis in India, with Jainism being the largest minority religion that is followed largely by Punjabi Banias and Bhabra people. The main language of the Punjabi people is Punjabi and its associated dialects which differ depending on the region of Punjab the individual speaker belongs to with notable differences in dialect found in Pakistani Punjabi (Lahnda dialect),However in Pakistani Punjab,many people speak Urdu but nearly all speak Punjabi,In Indian Punjab,all/or most people can speak Hindi,English is sometimes used,but not commonly. They may also speak Urdu, Hindi and English. There is significant Persian influence found in certain Punjabi dialects, although it is more pronounced in the Pakistani Punjab region, due to that regions proximity to the Iranic plateau. In recent years, the respective Punjabi languages have absorbed a considerable number of loan words from surrounding areas/provinces as well as from English and continue to evolve. Punjabi Cuisine has an immense range of dishes and has become world-leader in the field so much so that many entrepreneurs that have invested in the sector have built large personal fortunes due to popularity of Punjabi Cuisine throughout the world. Bhangra is one of the many Punjabi musical art forms that is increasingly being listened to in the west and is becoming a mainstream favourite. Punjabi music is being used by western musicians, in many ways, such as mixing it with other compositions to produce award-winning music. In addition, Punjabi Classical music is increasingly becoming popular in the west due to the beauty of sounds of the Punjabi language and its composition.The most common instruments used in both India and Pakistan Punjab are the Tabla Harmonium and sometimes Sitar. Punjabi Dances, due to the long history of the Punjabi culture and of the Punjabi people there is a large number of dances. These dances are normally performed at times of celebration the most prominent being at Punjabi weddings, where the elation is usually particularly intense. The overall style can range from very high energy to more reserved, however the common elements make it particularly attractive to the viewers whether they be of Punjabi heritage or not, the allure is considered universal. Punjabi dances are designed for either men or women. Punjabi wedding traditions and ceremonies are traditionally conducted in Punjabi and are a strong reflection of Punjabi culture. While the actual religious marriage ceremony, among Muslims, Sikhs, Hindus, and Jains may be conducted in Arabic, Punjabi, Sanskrit, Pali/Prakrit or English by the Kazi, Pandit, Granthi or Priest, there are commonalities in ritual, song, dance, food, and dress. The Punjabi wedding has many rituals and ceremonies that have evolved since traditional times. Punjabi receptions of all sorts are known to be very energetic; filled with loud Bhangra music, people dancing, and a wide variety of Punjabi food. Pakistani American-Punjabis and other Pakistanis in the U.S.
Indian American- Punjabis and other Indians in the U.S.
Punjabi Mexican American - A crosscultural merger of the first Punjabis with Mexican/Hispanic residents in California. According to statpak.gov.pk 44.15% of the Pakistani speaks Punjabi natively. This translates to approximately 76,335,300 Punjabi speakers according to the 2008 census (Total population: 172,900,000). "Punjabi Community". The United Kingdom Parliament. John Louis Esposito, Islam the Straight Path, Oxford University Press, Jan 15, 1998, p. 34. Gilmartin, David. Empire and Islam: Punjab and the Making of Pakistan. Univ of California Press (1988), ISBN 0-520-06249-3. Grewal, J.S. and Gordon Johnson. The Sikhs of the Punjab (The New Cambridge History of India). Cambridge University Press; Reprint edition (1998), ISBN 0-521-63764-3. Denzil Ibbetson, Punjab Castes: Race, Castes and Tribes of the People of Punjab. Cosmo Publications, ISBN 81-7020-458-5. Ibbetson, Denzil, (2002). Panjab castes. Low Price Publications. ISBN 81-7536-290-1. Latif, Syed. History of the Panjab. Kalyani (1997), ISBN 81-7096-245-5. Rose, H.A. Denzil Ibbetson, Edward Maclagan (reprint 1990). Glossary of the Tribes and Castes of the Punjab and North West Frontier Province. Asian Educational Services, India, ISBN 81-206-0505-5. Sekhon, Iqbal S. The Punjabis : The People, Their History, Culture and Enterprise. Delhi, Cosmo, 2000, 3 Vols., ISBN 81-7755-051-9. Singh, Gurharpal. Ethnic Conflict in India : A Case-Study of Punjab. Palgrave Macmillan (2000). Singh, Gurharpal (Editor) and Ian Talbot (Editor). Punjabi Identity: Continuity and Change. South Asia Books (1996), ISBN 81-7304-117-2. Steel, Flora Annie. Tales of the Punjab : Told by the People (Oxford in Asia Historical Reprints). Oxford University Press, USA; New Ed edition (2002), ISBN 0-19-579789-2. Tandon, Prakash and Maurice Zinkin. Punjabi Century 1857-1947, University of California Press (1968), ISBN 0-520-01253-4.